Parts of the following article appeared in the October 2014 issue of Geopolitics marking Air Force Day. Air Force is a technology driven service, much more so than the Navy or the Army. The last century saw rapid advances in military aviation technology, and the current century is seeing the trend continue. Since independence, the IAF has continually adapted to technological breakthroughs - jet propulsion, supersonic flight, airborne radars, electronic warfare, Precision Guided Munition (PGM), thrust vectoring, phased array multifunction radars, AESA radars, Network centric warfare, Optical Sensors, Stealth and UAVs. The IAF has absorbed and embraced these technologies and re-oriented its tactics to use them. Opinion is divided on how effectively and rapidly the IAF coped with past technological changes. Admittedly, there was a phase (mid sixties to early eighties) when the IAF appeared to go into slumber. It remained isolated from western Air Forces, despite being modeled after them. It didn't interact with the Soviet Air Force, despite the close geopolitical alignment of India and the Soviet Union because it shared very little with the Soviet Air Force other than aircraft and air combat weapon systems. 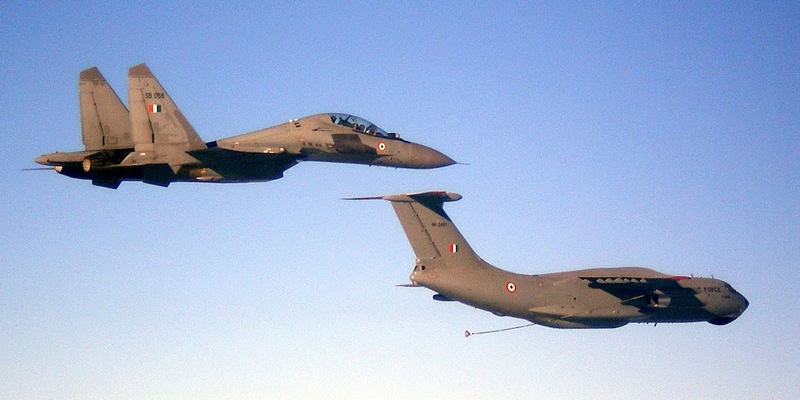 The IAF's isolation ended with the acquisition of the Jaguars in the early 1980s, and the Mirage-2000 later in the decade. The 1991 unraveling of the Soviet Union proved to be a turning point for the IAF. A mixed blessing, the breakup disrupted supply of spares for the IAF's Soviet origin weapons, but the end of the Cold War and consequent thawing of Indo-US relations allowed India to source its weapons from Israel, a close US ally. India found itself in a unique position - A country that could source its weapons from the best arms manufacturers in the world - from Russia, a time tested friend; from the US, a natural ally; and from Israel, a friend with bonds deeply rooted in history. The IAF took full advantage of India's unique positioning, perhaps more so than the Army and the Navy, blending Russian engineering with western electronics to come up with cost effective and potent marvels such as the Su-30MKI. The service started exercising with friendly countries across the spectrum - USA, UK, France, South Africa, Singapore - to imbibe best practices and improve interoperability. The IAF's recent exercise with the Russian Air Force - AviaIndra-2014- illustrates how far the IAF has travelled. The 1998 Pokhran nuclear tests and the resultant cooling of India's relations with the US forced the IAF to remain heavily dependent on Russia for its aircraft and missile requirements. However the setback in Indo-US relations proved short lived. Over the past 15 years, large scale induction of Su-30MKIs, upgrades to the IAF's MiG-21, MiG-27 and MiG-29 fleets; introduction of net centric warfare through AFNET and data links; induction of force multipliers like tankers and AWACS aircraft; and regular exercise with foreign air forces have added considerably to the IAF's punch. Acquisition of the MMRCA, planned upgrades to the IAF's Mirage 2000 and Jaguar fleets, and modernization of airfield infrastructure (MAFI) would continue the trend. The IAF still has a long way to go in areas such as ISR, UAS and UCAVs. Also, more challenging technological advances in military aviation are around the corner - Cooperative engagements, Optionally manned fighters, and hypersonic flight, to name a few. Resting on the oars, is not an option for the artistes of the sky! The IAF needs to press on with its new found nimbleness in adapting to changes. The service is now uniquely positioned to become the world's leading air force - an effective deterrent for our adversaries. The proverbial elephant in the room is financial constraint. China's GDP is three times larger than ours, a sobering handicap around which the IAF must draw its future plans. A close look at IAF's re-equipping plans over the the next 20 years proves to be reassuring - with Rafale, Tejas LCA, LCA Mk-2, FGFA, and AMCA fighters; Phalcon AWACS, EMB-145 AEW&C and Airbus A330 MRTTS force multipliers; and additional C-17s and C-130J transports in the pipeline. Too much perhaps has been written about the status of the Rafale project, so we will focus on the less talked about future fighter acquisitions. The Tejas LCA Mk-1 is just months away from FOC and induction into the IAF. In November 2001, while sanctioning Full Scale Engineering Development (FSED) of the aircraft, MoD stipulated December 2008 as project completion date. The date has since been revised to March 2015. The IAF has placed orders on HAL for 40 Series Production (SP) aircraft to equip two squadrons. The first SP aircraft is close to delivery; another two are scheduled to be delivered before the year end. Priced around $30 million, the Tejas is a very cost effective solution to the IAF's need for a lightweight air defense fighter with a credible strike capability; much easier to fly and far more lethal than the MiG-21 Bis / MiG-21 Bison aircraft that it's set to replace in the IAF. 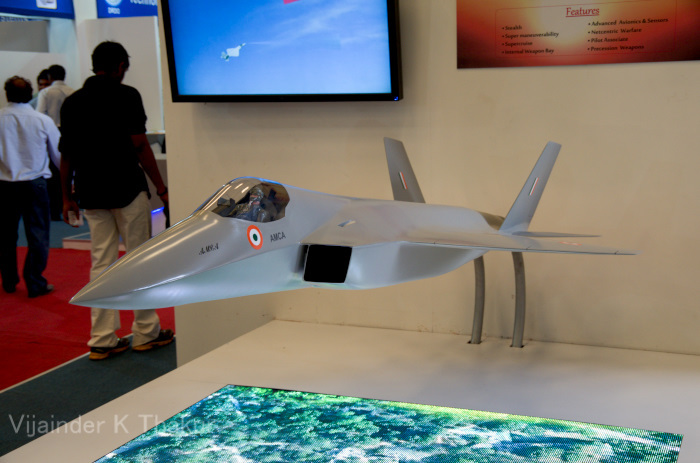 HAL plans to initially produce eight aircraft per year and later ramp up production to 16. It has signed Long Time Business Agreements (LTBAs) of 3-5 years with its sub-vendors to keep prices low, assuring vendors of production orders for up to 40-50 aircraft at a time. If HAL production of Tejas SP aircraft meets IAF's quality expectations, and the aircraft lives up to its promise in squadron service, the IAF would likely place additional orders for Tejas, especially in view of the delay in the LCA Mk-2 project. Despite the current IAF order for just 40, HAL has plans to meet a requirement of 200 Tejas LCA aircraft in the next decade! 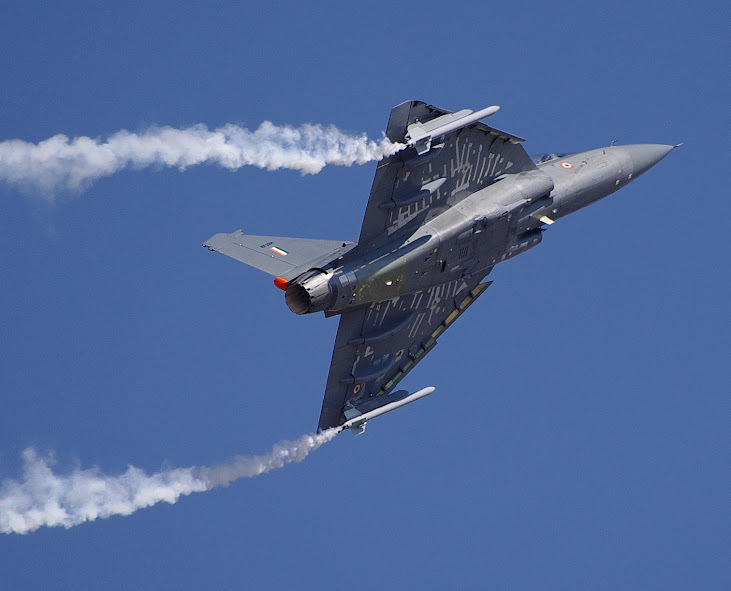 Though a cost effective fighter, the Tejas LCA powered by the GE-F404-IN20 engine, doesn't measure up to IAF Qualitative Requirements, because durIng its development lifecycle, the aircraft ended up being nearly 1.5 ton heavier than its designed weight. It was initially hoped that the weight gain would be compensated by fitting the more powerful GTRE developed Kaveri engine. However, in September 2008, it was conceded that the Kaveri wouldn't be ready in time. Performance shortfall like sustained turn rate and maximum low level speed could only be remedied through the use of a more powerful engine, so it was decided to develop a new variant of the aircraft powered by the more powerful GE-F414-INS6 engine. In a sense, the LCA Mk-2 is the aircraft that the IAF really wanted, not the Tejas LCA. Preliminary design of the LCA Mk-2 by HAL and ADA was to be completed by March 2014; detailed design was to start immediately thereafter. There is no confirmation that this has happened. ADA-HAL are designing LCA Mk-2 using DFMA (Design for Manufacturing and Assembly) methodology, which ensures that aircraft components are designed for easy manufacture, without adversely impacting the ease with which they can be fitted on the aircraft. The first time use of DFMA methodology in designing an aircraft would ensure better quality and quick ramp up of serial production after IOC. LCA Mk.2 was to make its first flight in 2014, with full-rate production to follow two years later. However, it is now evident that first flight is more than two years away. Despite the delay, if the LCA Mk-2 project delivers on its promise, it would prove to be a turning point in the evolution of the IAF. With air-to-air refueling, it would add significantly to the IAF's strike punch, besides boosting the IAF's air defense capability. India and Russia plan to jointly develop a version of the Russian T-50 aircraft customized for IAF requirements. The Indian version would use the T-50's airframe, engines and main systems, but differ in its avionics and weapon suite. The FGFA would use more composite and electronics developed in collaboration with Israel. Russia is planning to use the jointly-developed 5G fighter as an export variant of the T-50. The fighter is expected to enter IAF service by 2020. India's HAL and Russia's Rosoboronexport and Sukhoi signed a contract worth $295 million for Preliminary Design (PD) of the FGFA in December 2010. Under the PD contract, Indian engineers underwent 20 courses to familiarize themselves with the aircraft. The training was completed in July, 2011. The Russians provided Indian professionals with the original data and the software to create a single working environment. A group of Indian experts worked in Russia in January October 2012, and a group of Russian specialists in India. 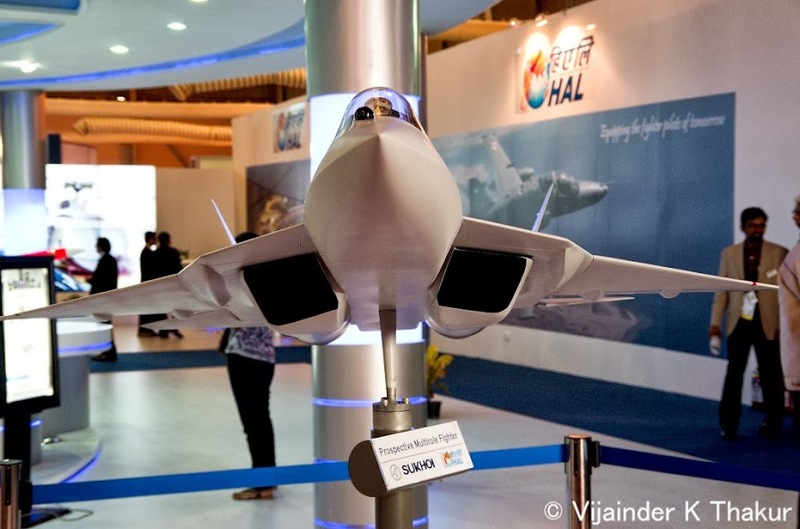 By April 2013, HAL and Sukhoi had finalized the design and technical specs of the aircraft and agreed on a work share for the research and development (R&D) phase. A contract for the aircraft's full-scale development, worth $11 billion, is expected to be signed during President Putin's scheduled visit to India in December 2014. The IAF was to evaluate the T-50 before signing a full scale development contract with Russia. At the time of going to the press, it's not clear if this evaluation has taken place. In September 2014, it was reported that the IAF isn't satisfied with the AL-41F1 (Product 117) engines that currently power the T-50, as also the aircraft's stealth features and weapons carriage system. Moscow-based Salut and NPO Saturn are building a brand new stealthy powerplant for the T-50, which is not a derivative of the AL-41F1 (Product 117) engine currently fitted on the aircraft. Called Product 30, the new engine will be 30% lighter and feature 30% lower life-cycle cost. Apparently, the R&D contract drawn up the the Russian partners doesn't cover fitting of the Product 30 engine. Additionally, there are differences between the two partners over the operational capability of the Tikhomirov-NIIP N036 Byelka AESA radar of the aircraft and the IAF is concerned about the overall development cost, maintainability and safety features of the aircraft. Difference between India and Russia at this stage of the program are not surprising, and certainly not alarming. The in-fashion 'joint production' labelling in reality clothes what is essentially a buyer seller relationship and buyers-sellers squabbles over the price and usefulness of a new product are only to be expected! Meanwhile in Russia, state testing of the T-50 started in May 2014 and deliveries of the aircraft to the Russian Air Force are scheduled to start in 2016. In other words, once the FGFA development contract is inked, its success would be assured with timely deliveries, as was the case with the Su-30MKI program. During Aero India 2013, the then CAS told journalists that the first prototype of the aircraft would arrive in India in 2015, the second in 2017, and the third in 2018. India plans to acquire 214 aircraft by the end of 2030., but could well end up buying over 400. China is developing two stealth fighters - J-20 and J-31. Like the US F-22 Raptor and the F-35 Lightening-2, the J-20 and J-31 are designed to evade detection by ground based radars. China also has VHF AESA ground based radars that can detect Low Observable (LO) aircraft like the US Raptor and Lightening-2. Unlike the US and Chinese LO aircraft, the T-50 isn't designed and equipped as much to evade detection by ground based radar, as to detect the Raptor earlier and engage it in close combat to assert its superior maneuverability. The T-50 / FGFA would have a similar advantage over the two Chinese stealth fighters. The IAF has done well in choosing the T-50/FGFA over the F-35 Lightening-2. The FGFA would make a worthy successor to the venerable Su-30MKI and secure the future of our country till the middle of this century. The Advanced Medium Combat Aircraft (AMCA) is conceived to be a 20-ton category fifth generation LO fighter featuring super maneuverability, super cruise, and sensor fusion. The project is currently in the design phase. Feasibility study was completed by end of FY 2011. The AMCA is being designed as an affordable fighter with swing role capability to meet the requirements of the IAF post 2020. It would carry 5 tons of weapons and be able to release them at supersonic speeds. As a 20-ton fighter with a 1,000km range, the AMCA will cover the gap between the 10-ton, 500km range Tejas LCA, and the 30-ton, 1,500km range FGFA. ADA is hopeful that it will be able to incorporate some sixth generation fighter features. Sixth Generation features include improved range, persistence, situational awareness, human-system integration and weapon fit to counter enemy anti-access/area-denial measures such as electronic attack, passive detection, cyber attack and directed energy weapons. The AMCA design is optimized for reduced signature, not maximized stealth. The aircraft is not shaped for all aspect stealth, like the US Raptor (F-22) or the Chinese Chengdu J-20. Instead, shaping is optimized to minimize frontal Radar Cross Section (RCS), as is the case with the T-50/FGFA. The AMCA will feature "serpentine-shaped" air intakes, internal weapons bays, and advanced radomes to increase stealth. Radar-absorbing composites and paints will supplement the design. AMCA blends stealth with maneuverability, while keeping costs affordable. The aircraft will be powered by a new engine that the GTRE plans to develop with the help of one or more foreign consultants, Snecma being one of them. Like the Lightening-2, Rafale and Eurofighter, AMCA will achieve supermaneuverability by using a powerful engine. However, if the IAF prefers thrust vectoring based supermaneuverability, ADA will tweak the aircraft design accordingly.